A veteran sportswriter reveals both the good and the ugly in the baseball great, recounting Mickey Mantle's many achievements and celebrated sportsmanship as well as his notorious alcoholism and his failure as a family man. TV tie-in. 15,000 first printing. 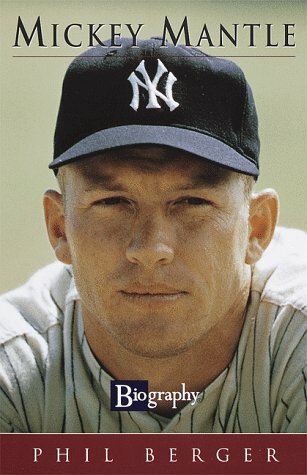 The life of Mickey Mantle is the rags-to-riches story of the American dream. Born in the midst of the Great Depression, the eldest child in a mining family, Mantle rose to be one of America's ultimate baseball heroes.<br />&nbsp;&nbsp;&nbsp;&nbsp;&nbsp;&nbsp;&nbsp;&nbsp;<br />In this portrait, veteran sportswriter Phil Berger recounts Mantle's stardom and the high price he paid to attain it. His father's sole passion was baseball, and he fervently dreamed that his first son would grow up to play in the majors. Under his father's relentless pressure, Mickey became a switch-hitter and refined his skills in all aspects of the game.<br />&nbsp;&nbsp;&nbsp;&nbsp;&nbsp;&nbsp;&nbsp;&nbsp;<br />In 1949, Mantle signed with the Yankees' minor league team in Independence, Kansas. It was a difficult transition for the temperamental ball player. Despite his powerful hitting, Mantle's quick temper plagued him, making his performance erratic and his future uncertain.<br />&nbsp;&nbsp;&nbsp;&nbsp;&nbsp;&nbsp;&nbsp;&nbsp;<br />However, in 1951, Mickey moved to the major leagues and with the Yankees soon came to epitomize the confidence and success of postwar America. He became the hero of his father's dreams.<br />&nbsp;&nbsp;&nbsp;&nbsp;&nbsp;&nbsp;&nbsp;&nbsp;<br />The man with this brilliant career also had a dark side. Phil Berger shows us the glorious Mantle and the alcoholic one, the good teammate and the absent father and husband, and all the other contradictions and complexities of one of America's greatest celebrity athletes.<br /><br />Mickey Mantle's baseball glory still shines through more than thirty years since his retirement, and it began on the dusty plains of Oklahoma, where Mantle's father drilled baseball into his son's bones, along with a drive to greatness. But greatness has its price--alcoholism, and the need to live up to his father's dreams shadowed Mantle throughout his life. Journalist Phil Berger goes beyond the legend to find the man beneath the Yankee pinstripes, the baseball player whose brilliance millions envied and whose flaws they felt themselves.